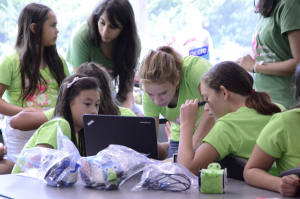 The C-STEM GIRL Camp Affiliate Program allows our partners to host Girls in Robotics Leadership (GIRL) camp and Girls In Robotics Leadership+ (GIRL+) camp for girls in their region. GIRL camp is focused on motivating girls in middle school through peer mentoring by college girls to learn leadership and STEM concepts through a fun and exciting robotics-based curriculum. Each camp will welcome 20 middle school girls as camp participants, two high school girls as assistant coaches, two female college students as coaches, and one female teacher/staff as a mentor and coordinator. The GIRL+ Camp motivates girls in high school to pursue STEM in higher education through a fun, hands-on robotics and Arduino curriculum. Each GIRL+ Camp will have 20 high school girls as camp participants, 2 female college students as coaches, and 1 female staff as a mentor and coordinator. Camp participants will learn and experience leadership and communication skills through peer mentoring and guest speeches by inspiring women leaders in various computing and STEM (science, technology, engineering, and math) fields. They are introduced to robotics, principles of engineering, and computer programming. Participants will also learn film production and the creative process involved in creating a video with robots. All GIRL Camps are funded by various sponsors and attendance is FREE for camp participants. Sponsorship is vital to the success of the C-STEM GIRL camps. The average cost of running a GIRL/GIRL+ camp is $3,000. Costs cover a minimum of 2 coaches, video cameras, USB Flash Drives, T-Shirts for participants, and coaches, lunch for campers and coaches, female/staff mentor and coordinator, Camp Fee, along with other consumable materials. Camp Affiliates may increase or decrease the funding needed based on current equipment, coach stipends and additional mentors. It is the goal of the C-STEM Center to expand the GIRL Camp offering to any school, district, and county office of education, and non-profit organizations in the nation, to inspire female students and to provide opportunities and knowledge to help them achieve their dreams. Have an administrator from school district, county office of education, non-profit, or a faculty from a college to serve as a C-STEM GIRL Camp Affiliate Director. Have a female teacher or staff to serve as a C-STEM GIRL Camp Mentor paid by the Affiliate for the week of the camp at the standard district pay rate. Have the budget to pay for two C-STEM GIRL Camp Coaches ($500 for each coach). Have the budget of $800 for each GIRL camp for the curriculum, training, support, recruitment of participants (campers, assistant coaches, and coaches), and assessment and evaluation. 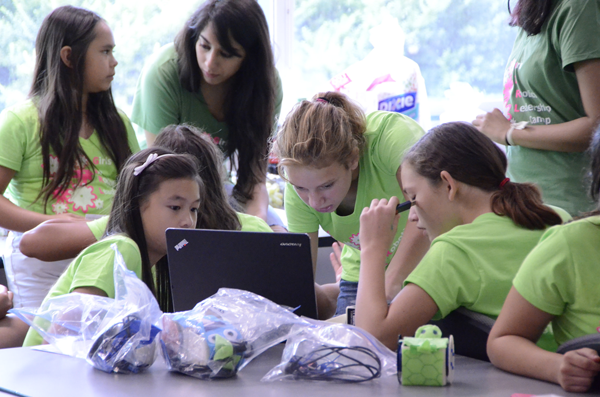 Have computing software and robotics equipment for the C-STEM GIRL Camp curriculum. Most school/districts should have these robotics resources already. A C-STEM GIRL Camp Affiliate can purchase necessary hardware and software with C-STEM discount from C-STEM industrial partner Barobo. If you need to buy new equipment, we suggest that you buy a 16 Linkbot Classroom Bundle, 16 Linkbot Dongle Classroom Bundle, optional 4 RoboPlay Packs and 4 2019 RoboPlay Supplementary Packs. If you are a non-profit organization, we can help pair you with a local C-STEM school to jointly organize the camp as the school may have the equipment available in the summer. For GIRL+ Camp, you will also need 10 Arduino Uno Starter Kit and 10 Linkbot Uno Pack. If you are a non-profit organization, we can help pair you with a local C-STEM school to jointly organize the camp as the school may have the equipment available in the summer. Have a space such as a computer lab or classroom with laptops in Windows or Mac OS X to conduct the camp. Have a college partner to bring campers for a campus tour, visiting labs, and have a lunch in a student dining common. If you are interested in joining the C-STEM GIRL Camp Affiliate Program to host a GIRL and/or GIRL+ Camp for girls in your region, please contact us at girlcamp@c-stem.ucdavis.edu. The C-STEM Center will help affiliates recruit and register coaches, assistant coaches, and camp participants through our web site. and provide training for coaches and assistant coaches. If you have any question, please contact us.